ABB , the leading power and automation technology group, has won an order worth more than $400m from the German utility E.ON Netz GmbH to supply the power equipment that will connect the world’s largest offshore wind farm to the German grid. ABB will connect the 400-megawatt (MW) Borkum-2 park using its innovative and environmentally friendly HVDC Light (high-voltage direct current) transmission technology, which gives utilities complete control over the power supply and increases grid stability. 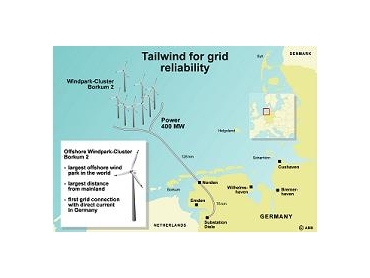 Located more than 100km off the German coast in the North Sea, it will be the most remote wind farm in the world. Scheduled to be operational in September 2009, the wind farm is expected to avoid CO2 emissions of 1.5 million tons per year by replacing fossil-fuel generation. Germany currently uses wind for about 7% of its electricity requirements and expects to double the share of wind energy by 2020. ABB is responsible for system engineering including design, supply and installation of the offshore converter, sea and land cable systems and the onshore converter. Most of the transmission system provided by ABB will be laid underwater and underground, thus minimizing environmental impact. HVDC Light offers numerous other environmental benefits, such as neutral electromagnetic fields, oil-free cables and compact converter stations, and is ideal for connecting remote wind farms to mainland networks without distance limitations or constraints on the grid.